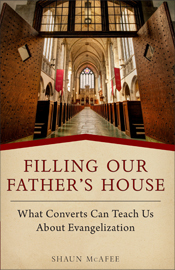 In the newly released book titled Filling Our Father’s House: What Converts Can Teach Us about Evangelization (Sophia Press), author Shaun McAfee does a wonderful job in showing Catholics how to apply the Protestant principles of evangelization to draw others into the Catholic faith. He shares resources and ways to develop your own personal testimony in order to share your Catholic faith with others. New converts and cradle Catholics, alike, can use and apply the methods outlined in each chapter, which are not typically taught in Catechism classes or Catholic Bible studies. There are many times when we may feel moved by the Spirit to share our story or want to bring friends and family to Church, yet we may not feel equipped or comfortable with speaking to others. We may not know how to express our own “why we believe” (our testimony). We also may feel inadequate in our personal knowledge of the Bible and understanding of Catholicism that we shy away from spreading the Good News. McAfee points out that it is Christ who told his disciples to go out and bring more people to him, yet many Catholics leave that mission at the door as they leave Mass. We each have our own story of why we believe, and McAfee shows us how to develop and share that testimony with others, so that by our story and example we can plant the seeds to bring others to Christ. He also shares his own personal testimony as a living example of how to tell and share your own story. In addition to our personal testimony, we also need to grow our own faith so that we can be an example of the Catholic Church to others. McAfee offers many suggestions and resources that we can use to come to love and understand the Bible, and different ways to meditate upon and memorize scripture. He shows us that if we do not deepen our relationship with Christ, there is no way we can personally spread his message. In order to become comfortable with sharing our faith, we are called to become involved in our Parish, not just by going to Mass but bringing life to the Parish from becoming more involved in the Church. McAfee brings to light some of the ways the Church has not been able to relate to the faithful, even though many of our Pope’s through the years have written about the need for Catholic evangelization. He shares the ways Protestants use to bring the faith to their people, and gives the reader practical ways to develop their own relationships with the Church and ways to share the faith with other believers and nonbelievers. McAfee writes a book that is easy to read and offers great insight into the world of evangelization that Catholics do not often explore or have a difficult time discussing. By applying the steps and using the resources recommended in the book, we can build our own personal testimony, grow closer to God through prayer and study, and become active in our Parishes. The ultimate goal is to be confident in our ability to bring others into the Catholic faith. Overall, the book is well researched and the resources and suggestions will guide every Catholic to feel more confident in who they are in the Body of Christ. It also shows us we are all called to share with others the Body of Christ. The reader will find themselves highlighting key resources and dog-earing the pages with valuable tips. I highly recommend Filling Our Father’s House to anyone also looking to share the Catholic faith and develop their own personal relationship with God the Father and Jesus Christ. Book Review, Catholic Upgrade, Filling Our Father's House, McAfee. Bookmark.